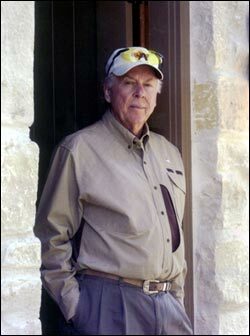 Throughout his life, T. Boone Pickens has always followed his own path. A number of his initiatives reflect a long-standing vision about America’s reliance on fossil fuels and his love for both the land and individual rights. When it comes to environmental stewardship, Boone felt a unique connection to the past. He implemented a passionate vision that restored his 68,000-acre Mesa Vista in the Texas Panhandle to a pristine prairie-like environment that prevailed in this region for centuries. As a result, the ranch, like its owner, never stops evolving, innovating, or celebrating a zeal for outdoor stewardship. Prior to Pickens’ first land purchase of 2,926 acres in 1971, the rolling hills, bluffs, and creek beds here suffered from years of overgrazing. The legendary entrepreneur immediately began a multi-step program to help the land recover, over time investing millions for wildlife management programs and facilities, installing water sources, food plots, and native grass replanting. Mesa Vista is the manifestation of one of Pickens’ first, and longest-held, loves. “Quail hunting is a life-long passion tracking back to my father, who always kept two bird dogs in a pen out back of our home in Holdenville, Oklahoma,” he explains. “Eastern Oklahoma was big, open, country. I shot my first quail when I was thirteen years old. That passion, fueled by decades of extraordinary business success, helped transform Mesa Vista into a model of conservation and habitat management for the bobwhite quail, a species under serious threat from changing agricultural practices and urban encroachment. Beginning in 1979, Mesa Vista in stages installed an extensive waterline grid that covers more than 50 miles, with surface access every 1,000 feet. Pickens sought out land along the Canadian River and creeks and habitat-friendly rolling hills, home to about 1,000 strategically located feeders. Pickens’ staff supervised the conversion of fourteen irrigation circles from cash crops to wildlife feed and cover, which support an excellent pheasant population as well as providing dove shooting in the fall of the year. A multi-year quail study, sponsored by Pickens, explored the effect of heat, water availability, and overgrazing on quail. These steps helped increase bird count per acre from one-fourth to one-and-a-half, and annual counts of up to forty kinds of native birds. During that same time, the bobwhite to blue quail ratio increased from 20 percent bobwhite and 80 percent blues to 90 percent bobwhite and 10 percent blues. Bobwhites moved from primarily the ranch’s creeks and plum thickets throughout the ranch. The construction of new lakes and streams led to a dramatic increase in waterfowl and a rise in the turkey, deer (whitetail and mule), antelope, and pheasant populations. While the ever-thinking Pickens feeds his passion at Mesa Vista, spare time spent there is hardly that. He has never relied on a master plan for wildlife improvements; rather Mesa Vista is a work in progress, and will remain so as long as its owner lives. He is constantly dreaming up improvements to the property, evidenced by the notebooks his ranch employees maintain at the ready to jot down the torrent of ideas that occur to Pickens as he drives across the ranch. The ever-evolving, innovative stewardship Pickens brings to Mesa Vista is deep-seated in his early years spent hunting in the area. As he preserved his youthful memories, he shaped a habitat that will serve future generations. 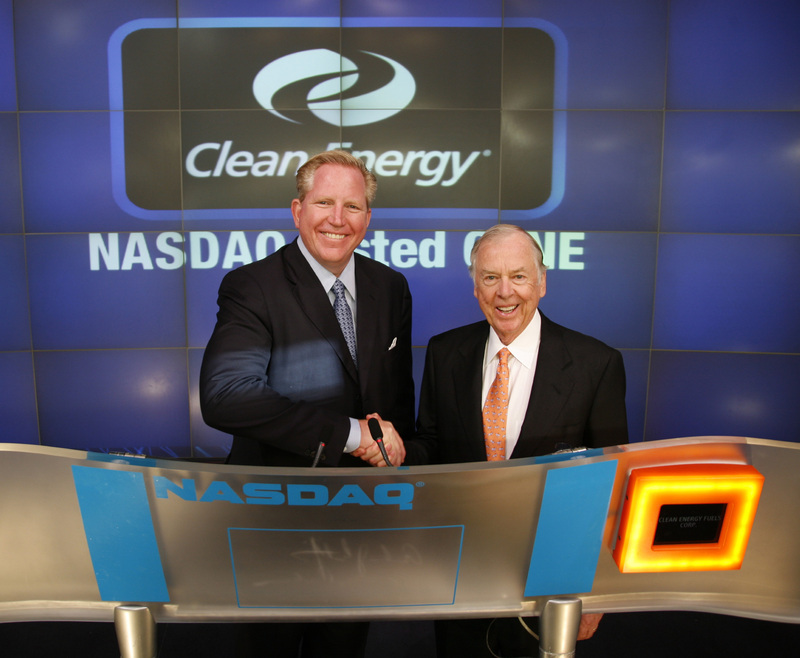 Perhaps Pickens’ most dramatic move occurred in July 2008, when he launched an $100 million national campaign to promote the Pickens Plan, a clean-energy alternative policy aimed at achieving greater energy security in America and addressing the OPEC oil threat. In television and print advertisements, in stories and every imaginable talk-show format, appearances before Congress, and town hall meetings across the country, he bluntly told other Americans: “I’ve been an oilman my whole life, but this is one emergency we can’t drill our way out of.” His scribbling white board presentations, in which he outlined U.S. dependence on imports, became water cooler talk throughout the nation. “A fool with a plan is better than a genius with no plan, and we look like fools without a plan,” he repeatedly has said. Named one of the world’s 100 most influential people by Time magazine in 2009, more than 1.7 million people enlisted in his Pickens Army. The campaign encouraged an outpouring of fresh ideas and a new generation of Americans to become involved in the policy process. 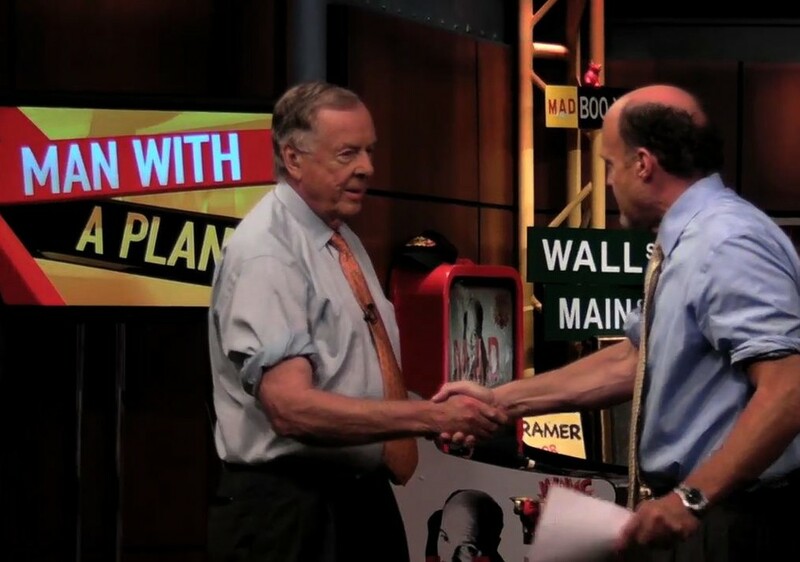 Pickens traveled the nation sharing with audiences his urgent plea to lessen our dependence on fossil fuels, invest in alternative energy and look for other ways to enhance U.S. energy security and stability. He brought his solution — switching the nation’s 18-wheeler truck segment to natural gas fuels, of which the United States has an abundance of supply, to the forefront of American debate and legislative action. He advocated quickly developing the country’s vast, domestic, natural gas resources as a principal transportation fuel to help to reduce its dependence on OPEC oil by up to 60 percent in just a few years. Although tight credit markets and transmission line issues prompted Pickens to cancel 2007-announced plans for the world’s largest wind farm in the Texas Panhandle, Pickens remains supportive of wind energy. For “his vision and leadership in moving the wind industry forward, ” the American Wind Energy Association named Pickens its 2009 Industry Person of the Year. He has long been one of the foremost advocates of a comprehensive energy plan for America, one that incorporates alternative energy solutions. His grassroots Pickens Plan campaign and his Pickens Plan Army made their opinions known to regional and national political leaders. The campaign reaped immediate results in both the 2009 Economic Stimulus Plan and Congressional legislation that pushed forward a new transmission grid plan and support for alternative energy resources, including wind, solar, and natural gas as a transportation fuel initiatives. His 2008 New York Times Best Seller (the second of his career), The First Billion is the Hardest, also detailed what he felt this country needed to do to win back its energy security. In the process, he made new allies across political lines that surprised many pundits. While Washington never really answered the bell in this fight, a wide range of corporate concerns and local-level politicians embraced the Pickens Plan. The Pickens Plan wasn’t the result of a sudden conversion, however. For years, Pickens had pressed presidents and industry representatives on the need for a coherent U.S. energy policy. The campaign lasted eight years, closing only after Pickens became convinced America’s energy security, with U.S. oil and gas producers leading the way, was a resolved issue. While Pickens was still with Mesa Petroleum, he became involved with natural gas fueling. He had a vision: to tap into natural gas as a vehicular fuel. His motivation was two-fold: one, to ensure a cleaner environment for future generations, and two, to secure this country’s energy security by reducing its dependence on OPEC oil. While chairman of the National Natural Gas Vehicle Coalition for almost three years, Pickens traveled the country advocating the merits of natural gas. When he left Mesa Petroleum and its management wanted to divest of the natural gas fueling concerns, he purchased them and in 1997 formed Pickens Fuel Corp. He touted natural gas as the best alternative vehicular fuel because it’s a domestic resource that reduces our foreign oil consumption, and enhances America’s energy security; clean (NGV vehicles emit up to 95 percent less pollution than gasoline or diesel vehicles); less expensive than petroleum and hydrogen; and safe (lighter-than-air compressed natural gas is nontoxic and disperses quickly, and has a higher ignition temperature than gasoline and diesel fuel, which reduces the chances of accidental ignition).